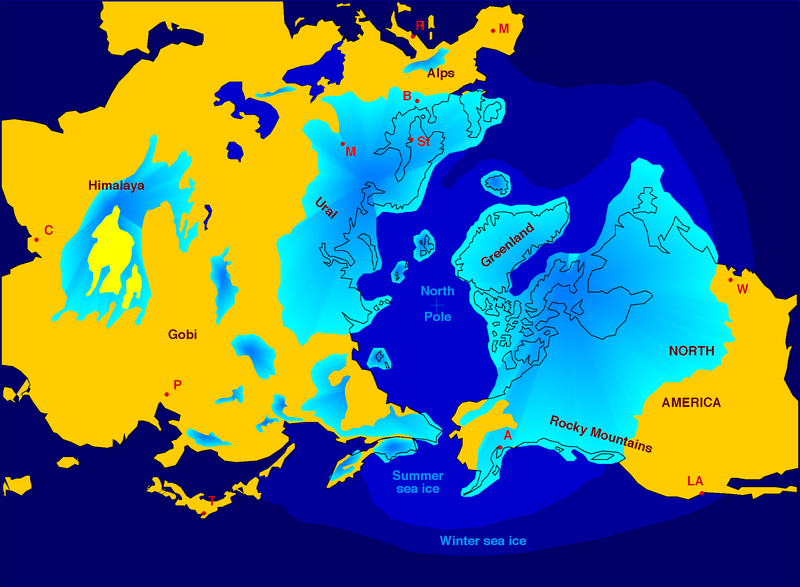 this is what the northern hemisphere looked like during the last glacial maximum, when sea level was about 300ft lower than it is now. which means that our landmasses all extended further out into the oceans back then. During glaciation, water was taken from the oceans to form the ice at high latitudes, thus global sea level dropped by about 120 meters, exposing the continental shelves and forming land-bridges between land-masses for animals to migrate. During deglaciation, the melted ice-water returned to the oceans, causing sea level to rise. This process can cause sudden shifts in coastlines and hydration systems resulting in newly submerged lands, emerging lands, collapsed ice dams resulting in salination of lakes, new ice dams creating vast areas of freshwater, and a general alteration in regional weather patterns on a large but temporary scale. It can even cause temporary reglaciation. This type of chaotic pattern of rapidly changing land, ice, saltwater and freshwater has been proposed as the likely model for the Baltic and Scandinavian regions, as well as much of central North America at the end of the last glacial maximum, with the present-day coastlines only being achieved in the last few millennia of prehistory. the rapidly shifting sea levels would also explain how the mediterranean got dried out and then flooded again, and other catastrophic floods of populated areas, which all of our cultural histories say we have in common. Posted on March 1, 2010, in research and tagged sea level. Bookmark the permalink. 1 Comment.